Lymph nodes, or lymph glands, are an important part of the body. In fact, the human body has around 600 lymph nodes. Lymph nodes contain white blood cells called lymphocytes. Generated by the immune system, these cells are designed to fight and protect us against infection and disease. Sometimes, the nodes swell, becoming tender and painful. In such cases, you may want to try home remedies for swollen lymph nodes. 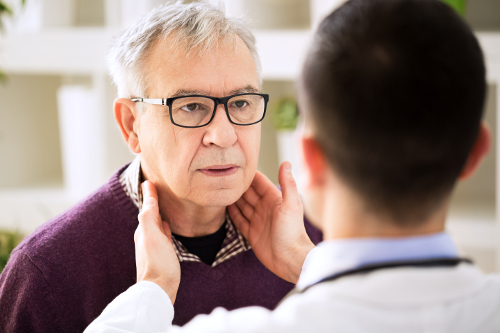 Lymphadenitis, or lymphadenopathy, develops when you have one or more swollen lymph nodes. You will find swollen lymph nodes in your armpits, around your neck, under your chin, behind your ears and head, and in your groin area. Swollen lymph nodes can be as small as a pea or as large as an egg. Lymphadenitis is caused by viruses, bacteria, and fungi. Strep throat and other infections like tuberculosis, mononucleosis, or cat scratch disease are some of the most common causes. In this article, we will share tips for how to get rid of swollen lymph nodes naturally. Although swollen lymph nodes may get smaller without treatment, other times treatment is necessary. The following are 10 home remedies for swollen lymph nodes. Both warm and cool compresses are able to reduce the size of swollen lymph nodes. A warm or cool compress can improve blood circulation, and therefore reduce swelling, pain, and swollen lymph nodes. Place a warm washcloth or cool compress on swollen lymph nodes for five to 10 minutes. Repeat this a few times daily to reduce swelling. Many also use apple cider vinegar for swollen lymph nodes. The acetic acid in apple cider vinegar has antibiotic properties that help boost immunity and treat infections. Apple cider vinegar is considered a great lymphatic tonic that helps promote lymphatic drainage and detoxify the body. This allows the lymph nodes to protect the body against illness. For an apple cider vinegar lymph node cleanse, consume two tablespoons of apple cider vinegar in a glass of filtered water three times daily. You can also combine equal amounts of unfiltered apple cider vinegar and filtered water. Soak a washcloth in this solution and apply it to the swollen lymph node. After five minutes, rinse off the solution with warm water. Repeat this twice daily. Raw garlic is loaded with the compound known as allicin, which is responsible for killing countless microorganisms and infections. The antifungal, antiviral, and antimicrobial properties in garlic also help relieve infections that can lead to swollen lymph nodes. Consume two to three crushed garlic cloves daily until your infection goes away. Chopping garlic is known to activate its alliinase enzymes, which produce the infection-fighting allicin. Vitamin C is one of the better vitamins for swollen lymph nodes. Vitamin C is known to improve an immune system that is fighting an infection. At the same time, vitamin C can help lower the chance of swollen lymph nodes—a sign of an infection. While high doses of vitamin C are available in supplement form, it is also a good idea consume lots of vitamin C-rich foods. Some good choices include pineapple, oranges, papaya, strawberries, broccoli, bell peppers, kale, and cauliflower. Raw honey, especially Manuka honey, is known to stop the growth of bacteria and treat bacterial infections that lead to swollen lymph nodes. You will want to consume genuine UMF (Unique Manuka Factor) honey with a rating of UMF10 or higher. The UMF rating tests the antibacterial performance of the honey and compares it to the disinfectant phenol. To get the most benefit from Manuka honey, take a dose of one to two tablespoons of it daily. If you find the taste too sweet on its own, add it to your favorite herbal tea, such as ginger or peppermint. Gargling salt water could reduce inflammation and swelling in the lymph nodes in the neck due to a throat infection. Add half a teaspoon of coarse sea salt to a glass of warm, filtered water. Gargle salt water a couple of times daily for about a week for best results. Turmeric (Curcuma longa) is the main spice found in curry, and it’s thought to be the most powerful herb in the world. The active ingredient in turmeric is curcumin, which targets the swelling associated with swollen lymph nodes. Combine a tablespoon of turmeric powder with enough honey for a paste. Apply this mixture onto your swollen lymph node, and after 10 minutes, rinse it off with warm water. Do this twice daily for one week. Astragalus root (Astragalus membranaceus) has a long reputation for boosting the immune system, and therefore helping to reduce swollen lymph nodes. This is due to the antimicrobial, antiviral, and anti-inflammatory properties of astragalus root. One 2012 study found that astragalus root is able to regulate immune response by controlling t-helper cells. Astragalus root can be taken as a capsule or tincture or purchased as dried astragalus and added to hot water for astragalus tea. Other herbal remedies that treat swollen lymph nodes include Echinacea, licorice root, cleavers, ginger, slippery elm, peppermint, mullein, olive leaf, goldenseal, sarsaparilla, and fenugreek. Essential oils are also effective against infections. Oregano essential oil, tea tree essential oil, lemon oil, cypress oil, myrrh oil, and frankincense oil are some helpful options. To use essential oils, inhale them, diffuse them, or apply them topically to your swollen lymph nodes. When using essential oils on the skin, combine a few drops with equal parts of a carrier oil like jojoba oil or coconut oil. Oregano oil can also be taken internally for two weeks at the most, but be sure to consult a professional before trying this method. There are also specific homeopathic tinctures that help drain the lymphatic system. Consult a homeopath for the best remedy based on your physical, mental, and emotional symptom picture. In general, you will benefit from an anti-inflammatory diet designed to boost the immune system and protect against swollen lymph nodes. In this section, we will take a brief look at what foods to eat and what foods to avoid with swollen lymph nodes. Foods that boost immunity include high-fiber, dark green leafy vegetables such as bok choy, kale, and spinach; Brassica vegetables like broccoli and cauliflower; sulfur-containing foods like garlic and onions; probiotic foods like kimchi, sauerkraut, and kombucha; and healthy fats like wild-caught fish, coconut oil, flaxseed, and avocados. Your diet should also contain plenty of freshly squeezed vegetable juices, soups and broths, herbal teas, and steamed vegetables. Sugar in general will reduce the number of white blood cells that the body produces, and this depresses the immune system. You will also want to remove highly processed foods from the diet, including refined grains, hydrogenated oils, fried foods, and dairy products. Additionally, remove all food allergens from your diet. Foods that tend to cause allergies, sensitivities, or intolerances include soy, dairy, gluten, wheat, corn, and artificial sweeteners and preservatives. Lymph nodes are part of the immune system and protect you against disease and infection. However, swollen lymph nodes can be caused by fungi, bacteria, or viruses. Throughout this article, we learned about the many home remedies for swollen lymph nodes, including a warm compress or cool compress, apple cider vinegar, raw garlic, vitamin C, Manuka honey, salt water, turmeric powder, astragalus root, essential oils like tea tree oil, and homeopathic remedies. Exercise and yoga can also help increase the flow of the lymphatic system. Regular massage therapy is another of the many natural remedies for swollen lymph nodes. You can also massage your own lymph nodes daily for around 15 minutes, which will stimulate them and improve lymphatic function. Huang, L.F., et al., “The effect of Astragaloside IV on immune function of regulatory T cell mediated by high mobility group box 1 protein in vitro,” Fitoterapia, Dec. 2012; 83(8): 1514-1522, doi: 10.1016/j.fitote.2012.08.019.